This comprehensive text examines existing and emerging electrical drive technologies. The authors clearly define the most basic electrical drive concepts and go on to explain the most important details while maintaining a solid connection to the theory and design of the associated electrical machines. Also including links to a number of industrial applications, the authors take their investigation of electrical drives beyond theory to examine a number of practical aspects of electrical drive control and application. * Provides a comprehensive summary of all aspects of controlled-speed electrical drive technology including control and operation. * Handling of electrical drives is solidly linked to the theory and design of the associated electrical machines. Added insight into problems and functions are illustrated with clearly understandable figures. * Offers an understanding of the main phenomena associated with electrical machine drives. * Considers the problem of bearing currents and voltage stresses of an electrical drive. * Includes up-to-date theory and design guidelines, taking into account the most recent advances. 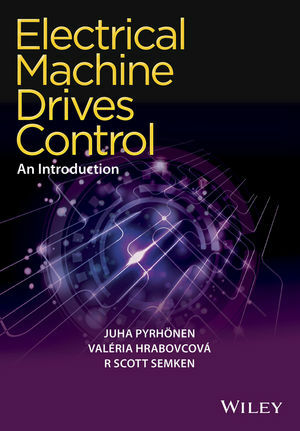 This book’s rigorous coverage of theoretical principles and techniques makes for an excellent introduction to controlled-speed electrical drive technologies for Electrical Engineering MSc or PhD students studying electrical drives. It also serves as an excellent reference for practicing electrical engineers looking to carry out design, analyses, and development of controlled-speed electrical drives. Juha Pyrhönen is a Professor in the Department of Electrical Engineering at the Lappeenranta University of Technology, Finland, He is engaged in the research and development of electrical motors and drives. He is especially active in the fields of permanent magnet synchronous machines and drives and in solid-rotor high-speed induction machines and drives. He has been an innovator in many industrial development projects and has produced numerous publications and patents in the field of electrical engineering. Valéria Hrabovcová is a Professor of Electrical Machines in the Department of Power Electrical Systems, Faculty of Electrical Engineering, at the University of ilina, Slovakia. Her professional and research interests cover all kinds of electrical machines, including electronically commutated electrical machines. She has worked on many research and development projects and has written numerous scientific publications in the field of electrical engineering. R Scott Semken is a Doctor of Science in Technology working in the School of Energy Systems at the Lappeenranta University of Technology, Finland. He focuses primarily on the mechanical aspects of motor and generator technologies, in particular, permanent magnet synchronous and solid-rotor high-speed induction machines and drives. The unique problems associated with very high power direct-drive wind turbine drivetrains have been an area of recent interest leading to in depth investigations of stator winding cooling and manufacturing approaches and large diameter permanent magnet rotor structures.